On Monday, the 22nd of May, 2017, in the week of celebrating its second anniversary, the Slovenian Australian Academic Association – SAAA held its first event, the SAAA Conference 2017: Australian and Slovenian current and future research opportunities. 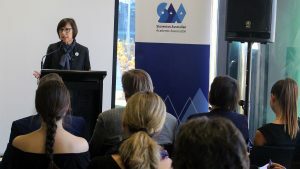 The event, opened by H. E. Mrs Helena Drnovšek-Zorko, Ambassador of the Republic of Slovenia in Australia, took place at the EU Centre RMIT in Melbourne. 36 conference participants had the opportunity listening to 17 speakers including two keynotes Professor Glenda Sluga and Professor Zlatko Skrbiš. For more info please visit the conference pages. A photo gallery is available also on Facebook.